As per Ms. Hamm’s request for an update: “Frankendog” has arrived home today. Nothing wrong with her eyes (the flash did that), but the staples running down her chest seem a bit off… Nonetheless, she’s better than when she left. Dr. Indrieri cut her open and fixed her up right. We are accepting cards, notes, and anything to aid further repair here. Too tired for much else. Except to say (unrelated to the dog), the sappy idealism in this Ray Lamontagne song, “Forever My Friend,” crept into my drive home and is enough to make one heartsick. Which is why I love it — tonight. 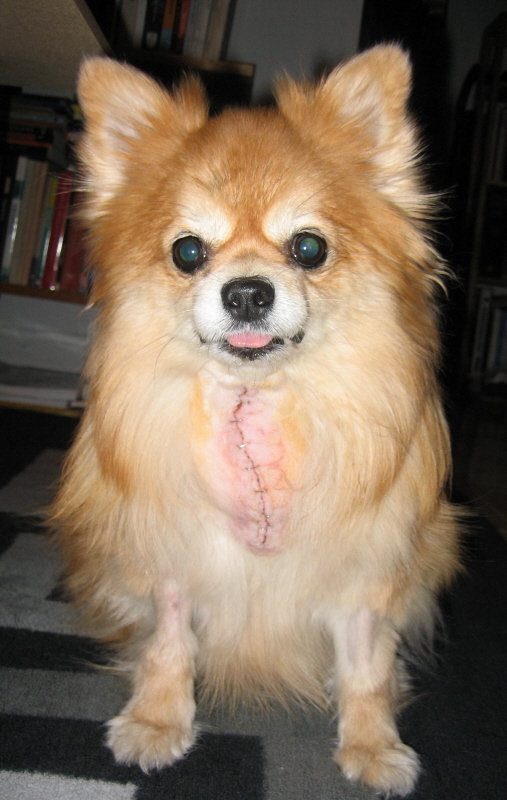 May 2nd, 2006 at 8:03 pm eShe looks really great for what she’s been through — all bright-eyed and invisible tailed. I thought she was having back surgery… so why the stitches… in front. Here’s for a great recovery! May 3rd, 2006 at 3:44 am eThanks, Christine — apparently they go in through the front to operate on the back. Go figure. May 3rd, 2006 at 2:35 pm eshe looks great! here’s to you, pup! May 4th, 2006 at 4:55 pm eWho would ever guess that such a small creature could be so tough? Doggie has mad street-cred now. May 4th, 2006 at 8:04 pm eSo glad puppy is better! I know how awful it feels for one of your animal babies to be sick and have stitches and how you just want her to get better quick! Animals suffer pain much more bravely than humans.